Create Powerful Writing Momentum in Midlife | Writing & Book Coach | Marla Beck, M.F.A. Are you a midlife writer? Have you been struggling to put your writing first, when there are so many other responsibilities competing for your time, your attention and your focus? You are not alone. One of the biggest challenges busy, midlife writers share with me is this: they know how to hit their deadlines for work and other people (and they do so consistently). They just can’t seem to hit the writing deadlines they set for themselves. The writing that matters most to you – your legacy, the contribution you want to make, the impact you want to have on one small corner of the reading public — remains painfully unpublished (and frustratingly undone). Your face lacks that otherworldly sparkle, that brightness that lights you up from within whenever you’re actively focused on writing what truly matters. Your access to creative ideas? And flow? Meh. When you’re frustrated, stuck and not achieving your writing goals, you feel dejected. Disillusioned. If you’re struggling to commit to a writing goal, create your own, consistent writing time and move your writing career forward by finishing project after project after project, then please, listen up. You can choose to “will” yourself into producing, pushing or performing. But over time, and usually at the expense of uninspired writing results, strained relationships or health and much frustration…you will fail. 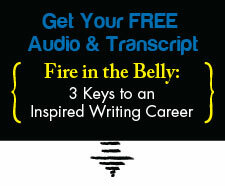 There IS another way to write consistently, finish your book and fire up your writing career. There IS a proven, rather straightforward path to write productively, by leveraging your capacity for hard work and your own innate temperament. There IS a proven, simple path to hit your own writing deadlines making more room for writing in your busy life than you ever imagined possible. There ARE a series of simple, high-yield steps you can take to reignite your creativity, your energy and your joy for writing…right from the very heart of the life you’re living. Best of all, this path doesn’t require you to reduce, disrespect or dismantle your responsibilities, roles or relationships in order to get your writing done. You can still be YOU as you achieve your writing goals with purpose, clarity and focus. You can still be YOU as you learn to integrate a consistent, highly productive writing practice into an already busy life and schedule. You can still be on-time, on-task and on-target at work. You can nail your own writing deadlines, too. So imagine, with me, this. Today is the start of the next quarter of the year, and, incredibly, you’ve figured out how to write consistently, how to focus, how to recapture your writing joy and how to integrate your writing practice and career goals into your unique life and responsibilities. Empowered, enlivened and equipped for the challenge, what new writing deadlines will you hit? What new writing goals would you be able to achieve? Would you finish your book? Publish more meaningful pieces? Pitch more courageously? I am here to show you the way. When you’re ready for a consistent writing practice, more joy for writing, a clear writing career strategy and more writing successes than you’ve had in years, contact me here and we’ll get to know each other. If I think I can help, I’ll invite you to meet me by phone or Skype. Your writing future depends on you.